No Stopping Us Now: Kids In RVA Are On The Move! 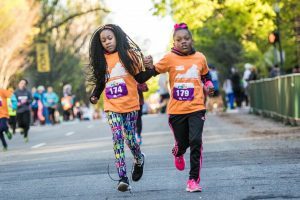 It’s that awesome time of the year again: Kids Run RVA and the Kids Challenge have kicked off for the spring season! Both programs have one common goal: KEEP CHILDREN MOVING! The Sports Backers’ Kids Challenge began on February 5th. The Kids Challenge is a FREE incremental mileage and incentive-based fitness program for elementary school-aged children in the metro Richmond area that encourages youth to run 26 miles over the course of a 10-week period leading up to the Ukrop’s Monument Avenue 10k presented by Kroger and Virginia529 Kids Run on April 14. The program provides flexibility for participants to run their miles at school with their friends or at home with their families and proceed at their own pace. We would like to give a special shout out to Optima Health, a new sponsor of the Kids Challenge. Optima Health shares our commitment to active living and healthy communities, and made it possible for us to offer jump ropes to the young runners who reach the 20-mile mark. 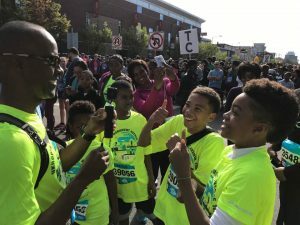 Sports Backers’ Kids Run RVA program promotes physical activity to youth across the Richmond region and encourages more kids to get moving more often. We offered several coaching clinics for new run club coaches to get familiarized with the basics of structuring and coaching a kids run club. Additionally, we hosted a spring season coaches’ kick-off as an opportunity for all volunteer coaches from across the metro area to meet and share ideas, knowledge. and best practices. Whether kids are running with a Kids Run RVA club or participating in the Kids Challenge, they all have the chance to be a part of the events at the Ukrop’s Monument Avenue 10k, one of Richmond’s favorite annual community traditions. On race day, thousands of youngsters from across the metro region will lace up their shoes and toe the starting line at either the Virginia529 Kids Run (one-mile fun run) or the 10k, thanks to the coaching efforts of our army of volunteers who provide guidance and lead training opportunities at schools and community locations. These youngsters will experience, many for the first time, the thrill and pride that comes with setting and accomplishing a physical fitness goal. They will pin on their race bib and enjoy the sights and sounds of the course with cheering spectators, bands, and spirit groups. And, of course, the most rewarding part of the experience is crossing the finish line and receiving their medal. Click here to see where our extraordinary parents, faculty, and staff are volunteering their time to KEEP KIDS MOVING this spring. Want to see these little runners in action? 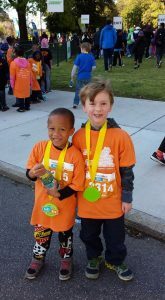 Come out and cheer them on at the Virginia529 Kids Run and Ukrop’s Monument Avenue 10k on April 14th!